I don’t mean to offend anyone here, so if you like black guitars, more power to you. Of late, I have puchased some new gear towards different ends. I recently posed a haul here..of the 4 guitars, the 3 electrics were black. I purchased a Jackson Rhodes RR3 MII on the cheap....black. Most of what i for see on CL and Offer Up and Letgo....black....or at this point blech!!!!! I can’t seem to get away from them. A Stagemaster in pretty bad shape has come up for sale not too far from me (closer to @Eddie) and something I have had my eyes out for and the color......blech..... I mean black. Why not more Blue (zy) HA! Anyway? Do most of you like black guitars and I am in the minority? squierbilly, dbrian66, porkpie and 3 others like this. Black is the best guitar colour there is! dbrian66, ElRey67, Davis Sharp and 1 other person like this. I'm thinking someone must have done a survey back in the 1800's and determined that the majority of people preferred black guitars. Maybe it was taken during Henry Ford's era when building Model T's. Or someone in the Fende/Squier MRP department ordered far more black paint than the others combined. 99% of Steinway pianos are black. But I sold/gave away a few black ones also. I need to catch up with some more whites ... but they tend to be pricier on the used market. I would like a blue one ... but no blue NC's were built. If I can find another cheapo black one, it would make a great host body to try to turn orange. VealCutlet, squierbilly, dbrian66 and 2 others like this. I guess you could buy a black one and make it Blue. Then it would be a truly Custom NC! Looking at a book right now called The History of The American Guitar by Tony Bacon (Friedman/Fairfax, 2001). Most of the 19th and 20th century guitars (museum pieces) are natural, sunburst, or black. I think @Eddie hit it - somebody must have taken a poll and thought, "Those are the guitar finishes most people are used to." dbrian66, drewcp, Bluzy and 1 other person like this. I do like black guitars. I do! And red ones. And blue ones. And green ones. And white ones. Sunbursts are cool too. And natural grain. Bottom line? I like guitars. dbrian66, MadJack, Davey and 2 others like this. I forgot that I have a Pinky on the side. It's in the gig bag because I have no place to put it. It's my travel guitar. dbrian66 and Taurus like this. I am with you ..... and it’s not that I dislike black, especially in certain configurations...but there are so many of them ! dbrian66 and Rey08 like this. .but there are so many of them ! Well they work with any color tie. More seriously a gloss black shows shape and contours better than most any color. Very often less eye favorable designs are made more appealing by such as color and decoration. (As is true with cars and many other things). The eye is made to see what is not there and not to see what is. Black forces the opposite, with the exception of size. Some people actually prefer decoration. Surface features. Others try not to see that -- to look past it to the efficacy and visual appeal of the basic design. For such black is often thought best. Oh, and did I mention how well it works with different color/pattern ties? The black body/black pickguard/maple fretboard is the most pleasing combination to my eye. Black is a neutral color (my 6th grade art teacher said it's a shade, but whatever). So, whether it's evolution or acclimation, we perceive it to be standard or inoffensive color on objects. It's easier to cover up scratches because you only have to decide flat or glossy (trans finished excepted). One could argue that it represents power or strength - think of SWAT teams, bouncers, and others who want to send a message through their clothing. So a black guitar may say, "I'm a badass." I can't figure out the big deal with sunburst. It looks like burnt toast to me. But they make a lot of those, so people must like them. I'm also not a fan of pastels on guitars, but Lake Placid Blue and Surf/Mint Green are big sellers too. So, when it comes to those colors, it's not you, it's me. squierbilly, dbrian66, drewcp and 2 others like this. dbrian66, porkpie, Davis Sharp and 1 other person like this. Barns are red and electric guitars are black. Since so many use it, that's the cheapest paint, and because it's the cheapest paint, many more use it. 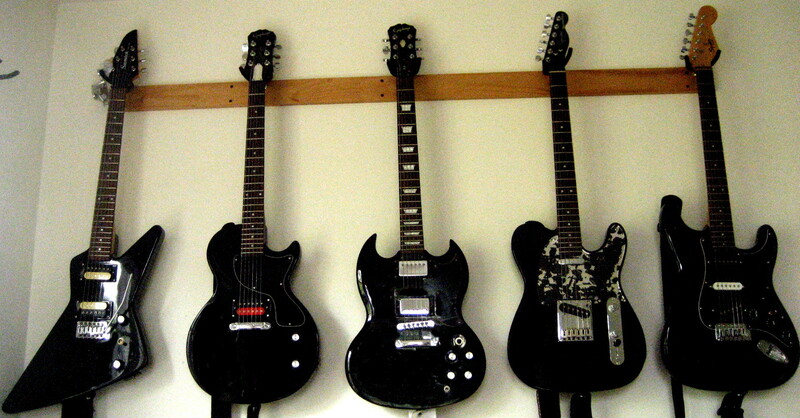 If you are buying used starter to mid-range guitars, most are black, it's unavoidable. The SG here was factory finished in black over top of the classic burgundy-red. Sometimes a retailer makes a big rush order and guitars in stock get re-coated. Or QC finds a poor looking grain pattern. dbrian66, porkpie, jjudas and 2 others like this. Im not a fan of black guitars, but sometimes that’s the only color that comes on the radar. And some guitars just look good in black. corn, squierbilly, dbrian66 and 5 others like this. In the beginning, the black ones were always cheaper! Today. the only black guitar I play is a Fender DG-60 that is my beat up grab it and go acoustic. Even the Squier Series hasn't been out of the case in a year or better. Mostly I plsy a Traditional Pro with a wine colored top, and my "strat" is bright red! I have a really good playing and sounding highly modded SE. Besides the fact that is a Strat, the only things that keep me from playing more than the little I do are that it has a rosewood fretboard (which I don't like on Strats and Teles) is the fact that it is black. Black is by far my least favorite color for guitars (or clothes and cars, etc. for that matter). I do have another black guitar that I do play a bit, an Epi LP Jr. The only reason I bought it was the fact I bought it new for something like $56. Still wish it had been anything but black. Some people must like them, just not me. 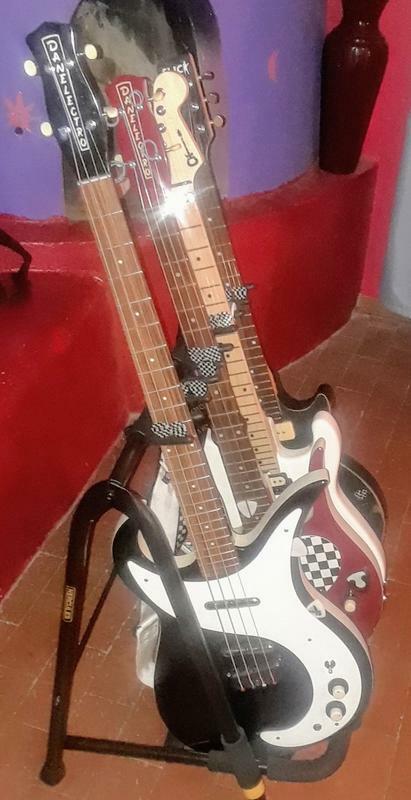 One of the moderators on the Epi Talk forum owns a bunch of guitars and every one of them is black. dbrian66, porkpie and Bluzy like this. I'm surprised no one hit on this; The preponderance of black guitars is attributed to Eric Clapton and his blackie. Why someone wants to mimic an artist eludes me, but that is the most common answer. Pre-Clapton, you see far more white, Butterscotch, SB. That was the origin of TV Yellow, white reflected badly on early black & white TV cameras, so they found yellow looked white on the black and white TV, without the overdriving reflection. Now we are just getting the results of shallow thinking. The makers made black in far more numerous numbers before and so they continuer to do so. I was never a black fan, but based on availability, I've made peace utilizing different pickguards to add some variety. NC which is about the only Strat I buy come in black, Olympic white, Dakota red and two tone (usually red tinted) sunburst. Approximately there are 10 blacks for every red, 5 or more red for every white and approximately 5 whites for every sunburst. End result, a lot of black guitars. I'm still chasing a SB I can afford. I have 9 black, 3 red, one white and no sunburst. Outside of Strats, I have one black Tele (a YN, contemporary of NC's) out of 3 Teles, , two black basses out of 5 and a black LP Junior. I have another black Junior highly modified in very slow boat from China build status. Lots of black. Davis Sharp, dbrian66, porkpie and 2 others like this. I have two black guitars out of all mine. I won't pay extra for a black guitar, but I will other colors when I find them. They got to make me smile after all. squierbilly, dbrian66, porkpie and 1 other person like this. Most of what i for see on CL and Offer Up and Letgo....black....or at this point blech!!!!! Exactly, most of them for SALE are black.too many finger prints to wipe off..if you like to Repaint those are the ones.....!! Rey08, dbrian66 and porkpie like this. I have re painted and when its warmer here it isn’t a bad thought to do so. dbrian66 and porkpie like this.